QuickStart the Focus for Senior Tennis of Volusia, Fla.
Senior Tennis of Volusia (STOV) has re-directed its focus to concentrate on growing tennis through the use of the QuickStart format. The STOV QuickStart program is designed to get youngsters 6-11 years old into tennis and loving it by using the basic fundamentals of life and athleticism and applying it to the game. 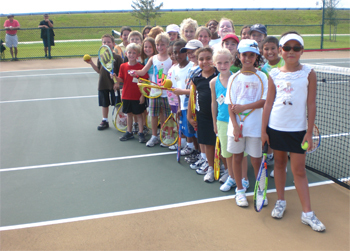 Youngsters learn balance, ball control, concentration, proper racquet handling, and team play. 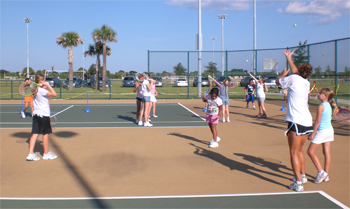 "My vision for this program is to see as many parents and automobiles parked around the tennis courts just like soccer and football," said Barbara Wong, president of Senior Tennis of Volusia, Inc., an official USTA Florida Community Tennis Association. "I will know then that we have mastered the art of growing tennis from the bottom up, which is the way it ought to be." Each QuickStart session runs for six weeks with two 1-hour classes per week. By the end of the 6 weeks the youngsters are playing tennis. In the last two classes they compete within their particular age group and the top three in each group compete against the coach for the final prizes. The program has grown to year-round with the primary site at the Viera Regional Park. Viera is the fastest-growing area in Brevard County. To-date over 100 youngsters has been through the program, and 51 are participating in the current session that ends on Oct. 30. At least 20% of the youngsters return to successive sessions. The next 6-week session begins on Nov. 11. The program also offers high school students the opportunity to earn community service points for college placement. STOV is using its QuickStart program as a feeder for the USTA Jr. Team Tennis League QuickStart Division with the plan to migrate them into the regular Jr. Team Tennis League. The league is expected to start in Brevard County by late January 2010. Quote from parents include "My daughter is really enjoying these classes and would love to continue," "My daughter is very interested in the tennis and wants to be in the tennis league," "My daughter is really enjoying the tennis. She wants to be in the league and I would like to make sure there is no conflict with the tennis matches and softball in the Spring. Hopefully the schedules will work out so she can do both," "My daughter is already your student and I want to make sure she is registered for the next session beginning November 11," "I think the QuickStart program is a great way to introduce tennis to kids. The Team Tennis League sounds like it would be fun for all involved," "My daughter would love to participate in the league. She is certainly enjoying the lessons and wants to continue," "My daughter is highly interested in the league," "I want to have both my son and daughter participating in the league," and "My son is interested in being part of the Junior Team Tennis League." Quote from the youngsters include "I like dancing to the tennis rules," "I like playing with the other kids," "I am having fun," and "I learn to concentrate, focus, and move to the ball."